The Los Angeles Memorial Coliseum in Exposition Park has produced heart-stopping thrills and iconic memories for nearly a century. Since opening in 1923, the designated National Historic Landmark has hosted the Summer Olympics and Democratic National Conventions, been home to USC football, two NFL franchises and welcomed iconic performers like The Rolling Stones and Bruce Springsteen. Pope John Paul II even celebrated Mass there with 100,000 worshippers. Degrassi, a long-time IBEW 11 member, helped put in Panasonic light panels in advance of the 1984 Summer Olympics and installed the electrical units in extravagant suites when Al Davis and the L.A. Raiders called the Coliseum home. And he’s back for more. Degrassi has also seen much of his work last. 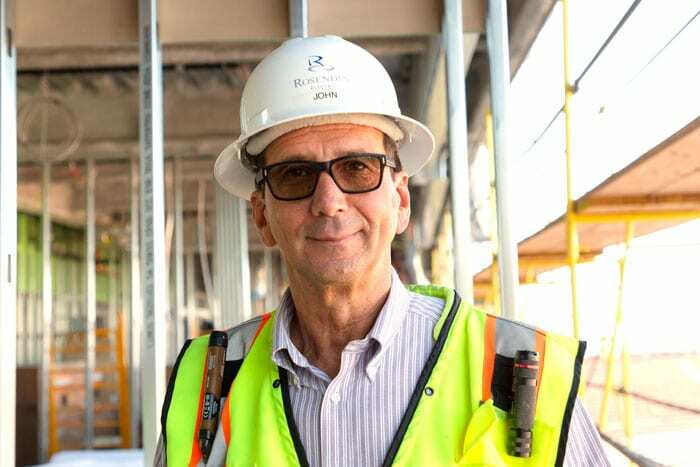 He’s helped with electrical wiring in countless high-rises downtown over the years and, more recently, the Wilshire Grand Center. While overseeing work on the Coliseum, he’s also pulling double duty frequently stopping by the new Los Angeles Rams stadium in Inglewood. Even though it’s hard to surprise Degrassi when it comes to a job at the Coliseum, the “Godfather” is finding surprises on this latest facelift. Speaking of history, in the summer of 2028, the Coliseum will become the first venue in history to host three Olympics. When asked if he plans on being in a hardhat for any potential work on the stadium for those games, Degrassi didn’t hesitate.